Raffaello Sanzio da Urbino (Aprile 6 or Mairch 28, 1483 – Aprile 6, 1520), better kent simply as Raphael, wis an Italian painter an airchitect o the Heich Renaissance. His wirk is admired for its clarity o form, ease o composeetion, an veesual achievement o the Neoplatonic ideal o human grandeur. Thegither wi Michelangelo an Leonardo da Vinci, he forms the tradeetional trinity o great masters o that period. Raphael wis enormously productive, runnin an unusually lairge wirkshop an, despite his daith at 37, leavin a lairge bouk o wark. Mony o his warks are foond in the Vatican Palace, whaur the frescoed Raphael Rooms war the central, an the lairgest, wark o his career. The best kent work is The Schuil o Athens in the Vatican Stanza della Segnatura. Efter his early years in Roum muckle o his wark wis executit bi his wirkshop frae his drawins, wi conseederable loss o quality. He wis extremely influential in his lifetime, tho ootside Roum his wirk wis maistly kent frae his collaborative prentmakkin. Efter his daith, the influence o his great rival Michelangelo wis mair widespread till the 18t an 19t centuries, whan Raphael's mair serene an hermonious qualities war again regairdit as the heichest models. His career faws naiturally intae three phases an three styles, first descrived bi Giorgio Vasari: his early years in Umbrie, then a period o aboot fower years (1504–1508) absorbin the airteestic tradeetions o Florence, follaed bi his last hectic an triumphant twal years in Roum, wirkin for twa Papes an thair close associates. ↑ Jones an Penny, p. 171. 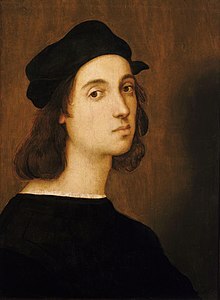 The portrait o Raphael is probably "a later adaptation of the one likeness which all agree on": that in The School of Athens, vouched for bi Vasari. ↑ Jones an Penny, p. 1 an 246. He dee'd on his 37t birthday; accordin tae different soorces, his birth an daith baith occurred on Guid Fryday. The matter haes been muckle discussed, as baith canna be true. ↑ See, for example Honour, Hugh; Fleming, John (1982). A World History of Art. London: Macmillan Reference Books. p. 357. ISBN 9780333235836. OCLC 8828368. ↑ Vasari, pp. 208, 230 and passim. This page wis last eeditit on 3 Januar 2018, at 22:33.